Summer is just around the corner! The temperatures are rising, and so are the health and safety risks to your canine companion as you venture out to enjoy our Island paradise. 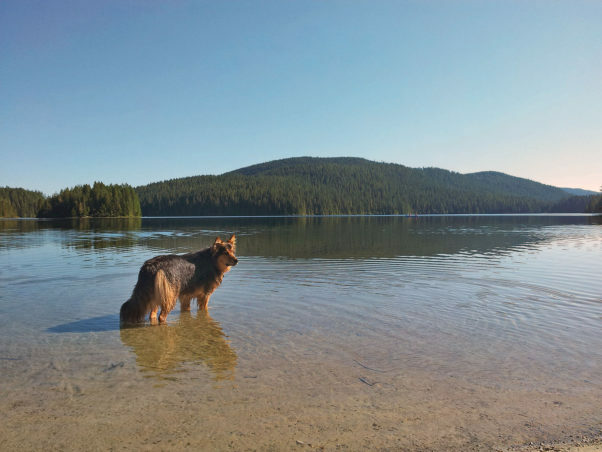 According to Dr. Mireille deWinter, Van Isle Veterinary Hospital, Courtenay, dog owners need to be on the alert for some summertime hazards. Elevated body temperatures (hyperthermia) can occur when dogs are left outside without adequate shade, are over exercised in hot/humid weather, or left in parked vehicles. Age, obesity, airway diseases such as asthma, and abnormal airway conformation in short-nosed breeds like pugs and bulldogs increase the risk of a dog suffering heat stroke. Every pet owner needs to know that heat stroke can be fatal. While you may be tempted to take your dog on outings during the hottest days of summer, they are best left at home. A dog suffering from heatstroke will initially appear distressed, panting and restless. Eventually,it will start to drool excessively and may become unsteady on its feet. If your pet is showing signs of heat stroke, move them into a shaded/cool environment. Lower their body temperature by placing cool wet towels on the back of their neck, in armpits and groin, as well as wetting the earflaps and paws. Transport to your veterinarian for further treatment. DO NOT overcool by forcing water into them but rather allow access to water once they are alert enough. Before taking your dog on an outdoor adventure, it is important to check the weather forecast. Even a leisurely walk down the street on a hot or humid day can cause your dog grief. Hot pavement and direct sunlight can result in sore feet and sunburns. A dog’s hair usually provides sun protection, but animals with light skin pigment and thin coats, shaved or bald patches can get sunburned. It is best to keep your pets out of direct sunlight. If they do get sunburned skin, you can apply aloe vera liberally and contact your veterinarian if needed. Hiking, running, horseback riding and mountain biking are great activities to burn energy, but most dogs do not understand the concept of moderation. Running too hard for too long can result in heat stroke. A day at the beach or river can result in excessive water intake, causing vomiting and diarrhea, as well as water or salt intoxication. Drinking too much fresh water can dilute electrolytes; too much seawater increases salt levels. Both situations can result in serious illness and even death. Many dogs go bonkers for balls and sticks and love nothing more than a rigorous game of fetch—on land or in the water. You can still have fun with your dog but reduce the risk of injury by choosing fetch toys wisely. A ball that is too small can become lodged in a dog’s throat and cause asphyxiation. Tossed sticks, caught in mid-air or bouncing off the ground, can impale the soft tissues of your dog’s mouth, resulting in serious injury. Dogs naturally will scrounge for food and eat almost anything. Peach and mango pits, corn cobs, bones, shish kabob skewers, watermelon rind and lots of other summertime favorite ‘people foods’ can cause life-threatening gastrointestinal obstructions or perforations in canines. Dogs may also ingest nasty stuff by scavenging while on walks or eating materials containing marijuana, tobacco and other intoxicants. Keep a close eye on your dog when out for walks, both on leash and off. If you see any physical signs of distress that are concerning you, contact your veterinarian. More time spent outdoors increases the chance of encounters with bees, wasps, and mosquitoes, as well as contact allergies from plants. Allergic reactions can result in minor signs of hives and well as facial swelling but can also cause airway swelling and anaphylaxis. If the affected skin becomes infected, inflamed or does not resolve, it is time to visit your vet. If your pet shows signs of weakness, wheezing, or unconsciousness, contact your veterinarian immediately. Fleas and ticks are the most common external parasites that we see in our climate due to the warmth and humidity for a good part of the year. Fleas most commonly cause topical irritations (scratching, scabs, hot spots) while ticks have the potential to carry disease. Talk to your veterinary clinic team about safe ways to control parasites with medication. If you plan to travel off the Island, be sure to ask about protection for Heartworm.